Bedrooms: 8 Bathrooms: 8 In Company Name Living area : 550 sqm. Westbury Apartments This property is comprised of 8 exclusive apartments, all thoughtfully designed by the current owner (Three 2 bedroom apartments, Two1 bedroom apartments, One 1 bedroom Penthouse and Two studios). The apartments are all beautifully furnished to a very good standard, with open-plan living spaces and neutral interiors that create calm and relaxing homes for holiday-makers and long-term residents. The current owner has installed a key-activated elevator, for access to all floors and private elevator access onto the second and third floors. There is also a fire-escape which can be accessed from all levels. There is a large and welcoming lobby area, and private car-parking at the front of the building which is securely gated. The apartments share an open-air swimming pool and sun terrace with a couple of neighboring buildings, providing a communal pool area for approximately 20 apartments. Westbury apartments has an additional private sun terrace on the roof of the building, for use only by residents of the building. These apartments are in a prime location in Pratumnak Hill, and are popular rental properties. The 3 apartments on the higher 2 floors have good sea views out towards Pratumnak beach, with garden views for apartments on the rear side of the property. This building has direct access onto Pratumnak road, where there are a selection of European and Thai restaurants and convenience stores. The nearest tax-route is within easy walking-distance, with one of the best spots on Pratumnak beach around a 10-minute walk away. This is an excellent business opportunity for anyone looking to invest in rental properties in Pattaya. With the building being sold under 1 title deed, in Thai Company ownership, this building is ideal for anyone looking for good rental returns in a building that needs absolutely no renovation. Bedrooms: 10 Bathrooms: 10 In Company Name Living area : 695 sqm. 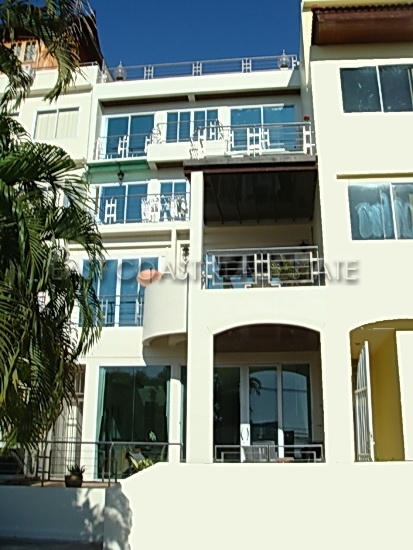 This is an excellent opportunity for an investor to buy both a residential home together with an income generating business on Pratumnak Hill, one of the most desirable parts of Pattaya. This development comprises of a town house which has been competently renovated to an exceptionally high standard and comprises of: 1 x studio apartment of 43 Sqm 5 x one bedroom apartments of 67 Sqm each 2 bedroom 167 Sqm penthouse Maid’s room/Office 43 Sqm. The building will also support the construction of a further floor above the penthouse considerably increasing the living space. There is off road parking for 2 cars and a number of motorcycles plus an almost Olympic sized communal salt water swimming pool. The property also benefits from an elevator which gives private access direct to the penthouse. Each apartment is fully furnished to a high standard comprising of open plan living areas, Large Bedrooms and fully equipped Shower rooms each self-contained apartment has its own water and electricity supply and is air-conditioned throughout. All apartments have a balcony with either a garden view which is owned by the city and is at the foot of Budda Mountain, being a protected area is both peaceful and tranquil or a sea view with the higher floors having a view of Koh Larn Island. Ground floor Maids Quarters / Office/ Storage 46 Square meters, En-suite Shower, WC and Vanity Unit. 1st Floor Apt 1 – Studio Apartment with Balcony open Plan living Kitchen Dining area with En-suite Shower room, WC and Vanity Unit fully tiled. Apt 2 – One Bedroomed Apartment with Balcony and Garden view, open Plan living Kitchen Dining area, Large Double Bedroom with Double bed and addition single bed fully tiled Bathroom with Shower, WC and Vanity Unit. Lift and Stairs to Second Floor Apt 3 – One Bedroomed Apartment with Balcony and Garden View Open Plan Living, Kitchen Dining area, Large Double Bedroom, Fully Tiled Bathroom with Shower, WC and Vanity Unit Apt 4 – One Bedroomed Apartment with Balcony Sea facing easy access to the communal area and swimming pool, Open Plan Living, Kitchen and Dining Area, Double Bedroom and Fully Tiled Bathroom with Shower, WC and Vanity Unit Lift and Stairs to Third Floor Apt 5 – One Bedroom Apartment with Garden Facing Balcony, Open plan Living, Kitchen and Dining Area, Double Bedroom and Fully tiled Bathroom with Shower, WC and Vanity Unit Apt 6 – One Bedroom Apartment with Sea View Balcony, Open Plan Living, Kitchen and Dining Area, Double Bedroom and Fully tiled Bathroom with Shower, WC and Vanity Unit Lift and Stairs to 4th Floor Penthouse Apt 7 The Lift takes you directly into the Open Plan Living area of this apartment, fully fitted kitchen with and Island site and tranquil living area, the Sea view Balcony has been glazed to provide an alfresco dining area, large hallway leading to Master Bedroom en-suite with Shower, WC and Vanity Unit, beautiful garden views. Bedroom 2 is also a double again with beautiful garden views a further Bathroom with Shower, WC and Vanity Unit, Stairs lead to the Upstairs outside Terrace which has Sea Views of Koh Larn Island and is a perfect area for private Sunbathing or Barbeques. There is a communal Swimming pool and a range outside communal areas on the first floor of the property. The Present owners have not explored any of the potential business avenues for rentals which could be long or short term lettings, however having made some local enquires it would be feasible to generate a conservative annual income utilising only the one bedroom and studio apartments of 1.6 million Baht this figure is based on charging 1k Baht per apartment per night and a 75% occupancy rate. Grosvenor House is owned in a Thai Company so no need to pay taxes or transfer costs. This great location shophouse is an opportunity for investors to generate business in Cozy beach area. The development of 34wah² compromises of a town house, which is currently opened as a massage shop. The property comprises of: 9 x Rooms 3 x Bathrooms 1 x Storage room Within the ground floor it includes 2 massive living rooms, an outdoor kitchen and toilet. The 1st floor consists of 4 rooms for multi-purpose use and a bathroom. Also, on the 2nd floor, there are 3 rooms sahring 1 bathroom and a storage room. Up on the roof, you will be able to see the view of the sea and experience the hill of pratumnak at the same time. For this price, you are looking at a great investment project. The title deed is in Thai name and tax and transfer will be split 50/50 between buyer and seller. Guest House & Restaurant for RENT nearby the beach. It is located in great location of Pratumnak Soi 5, within walking distance to the most peaceful beach in Town, 7-11 and other amenities. The building has 4 storey on 30 sq.wah. plot with approx. 450 sq.m. living space. Everything is ready to start your very own business. More details below; Ground floor: * Empty space with tables & chairs * Big European kitchen * Storage * 2 toilets * Backyard 2nd floor – 4th floor: * 5 guest en-suite bedrooms (one comes with very big terrace) * In each room, there will be; big built-in closet, TV and refrigerator, air-conditioning and safety box * Fitted bathroom with hot water shower * Laundry room plus big terrace with sea views on 4th floor Available for RENT min. 12 months with 2 month deposit and 180,000 THB one time key money.